Just wait a second. Before you get too excited here I want to make something perfectly clear. See these cookies? I know that you think I have been baking for weeks on end to bring you this special holiday post. The truth is….I didn’t make them. I received this lovely tin of mixed goodies from my son’s future mother-in-law who is one of the best bakers I know! Thank you Rocchina! It really is one of the nicest things to receive during the holidays or anytime – a gift of FOOD! What goes better with cookies than milk? Well now. 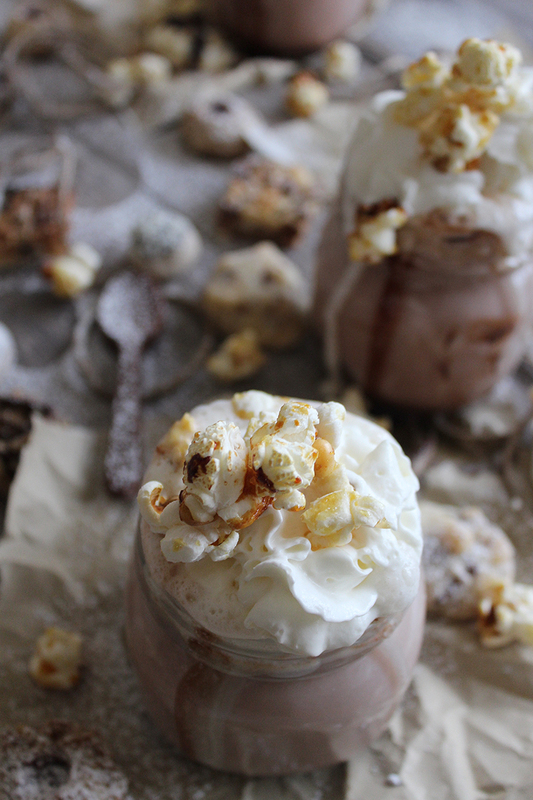 How about Nutella Cocoa? Not joking. I threw this together in literally under 5 minutes. You are going to love this cozy drink (if it ever snows around here)….right now I’m wearing flip flops in CANADA in the winter. Thank you Mr. El Niño ! An extra little treat I made to go with this hot drink are these cute little chocolate spoons. 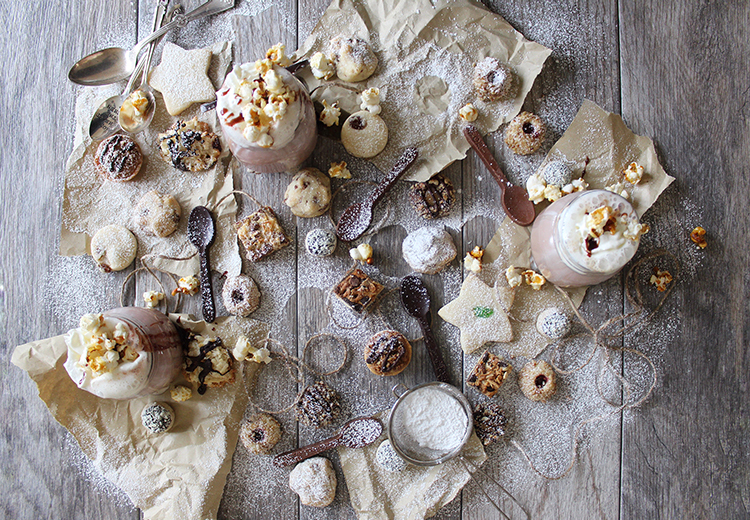 All you need is a candy mold and some melted chocolate….voilà! 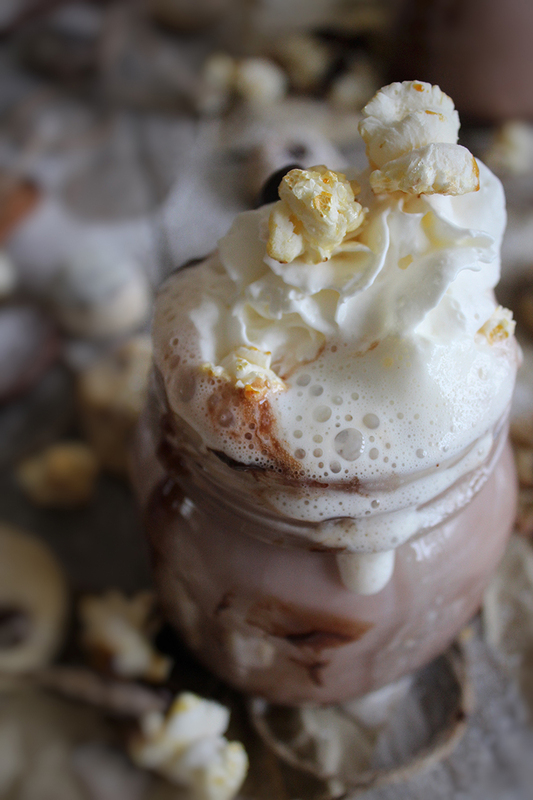 To top it all off, I placed some delicious caramel corn (another food gift I received from my friend Eve) on top of the whipped cream and drizzled it with more chocolate because ….yes….you can never have ENOUGH CHOCOLATE. Can I just quickly tell you about my hot chocolate story? Okay. Thanks. When I was little, my dad used to take me skating to a rink in mid -town Toronto. For those of you who live here, I’m talking about Forest Hill Arena. Yep, it’s still around. My dad would lace up my skates, then lace up his. Then he would hoist me up in his arms and I would wibble wobble around until I hit the ice. Then there was more wibbling and lots of wobbling. He held my hand as we skated around and around in circles for what seemed like hours. After falling a few hundred times (and I still do), my dad would always buy me a hot chocolate. I’m not sure what it was about that hot chocolate but after being on the ice it was the best thing I’ve ever tasted in my life. What am I getting at here? I can’t go skating now without having that hot chocolate afterwards. It’s a sweet memory that will last forever. 1) In a small saucepan, heat the milk to just below boiling. You don't want it to scorch so be careful. 2) Add in the Nutella and stir until dissolved. 3) Place into mugs or heat proof glasses. 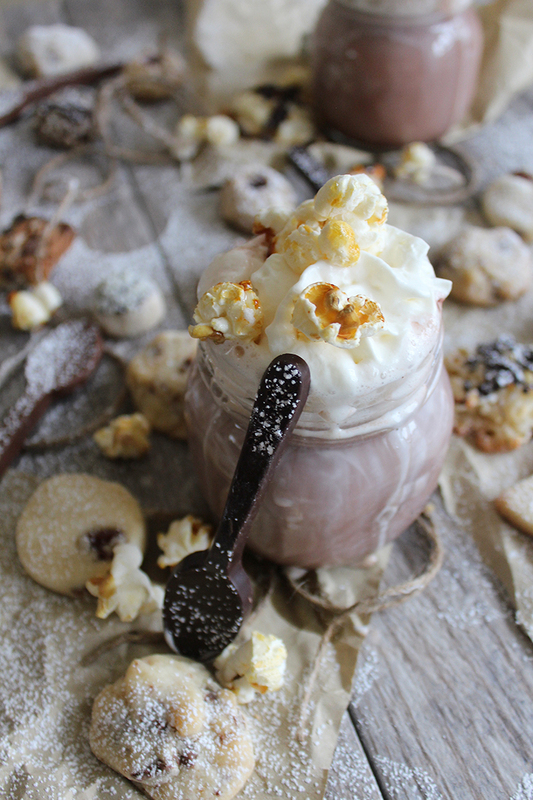 4) Top with whipped cream, caramel corn, extra chocolate drizzle and serve. 5) Place in a chocolate spoon if desired. They will melt into the hot cocoa and make the drink even better. Easy Chocolate Spoons -1 cup of melted chocolate - I used dark and milk -1 candy mold - I found one that has 6 sections shaped like spoons. 1) Place the melted chocolate in the molds and refrigerate for at least one hour. 2) Serve with hot cocoa.